Save a document as PDF! Unfortunately, it is not yet possible to export scores directly from FORTE into PDF documents. However, we are working on that feature and want to integrate it in the near future. To bridge the time, you can use a small program which is called “Foxit Reader”.This useful tool allows you to save your scores and excerpts directly as PDF document. After you have downloaded and installed the Foxit Reader, it will be available in FORTE under “File / Print”. We wish you a great weekend and very much pleasure with FORTE. 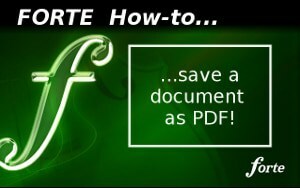 https://www.fortenotation.com/en/wordpress/wp-content/uploads/2013/08/001_FORTE_Howto_save_a_document_as_pdf.jpg 188 300 FORTE Team https://www.fortenotation.com/en/wordpress/wp-content/uploads/2017/11/new_logo_forte-1.png FORTE Team2013-08-16 12:42:462013-11-28 14:25:26Save a document as PDF! As a Student of Dr. Gloria W. Swisher, at Shoreline Community College, Seattle, Washington, I understand the time and attention required to make the quality product you offer, which is why I purchased Forte 8 Premium. I am asking, since Forte 10 is to be released soon, is it possible to upgrade Forte 8 directly to Forte 10? If so, please send me the details, and I’ll take it from there. I am also a graduate of Dunwoody College of Technology, Associates of Applied Science in Information Technology; and am actively working in that field. 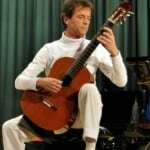 I do enjoy making compositions with the program and look forward to obtaining Forte 10 on its release. Haben Sie Einen Guten Tage! Dear Stanton, thank you very much for your message. There will be an update from FORTE 8 Premium to FORTE 10 Premium. Stay tuned to learn more about pricing, and how to upgrade. We will send out more e-mails in the weeks to come.